This unique cheese from western Switzerland has a flavor of delicate, typical mountain flowers and alpine herbs. The story goes that this unique cheese has its origins in the year 1115. At that time, the milk from around the picturesque small town of Greyerz was processed by the cheesemakers into an unmistakable product. The guidelines of the AOP specifications are very strict. The basic conditions include a small production area, limited to parts of French Switzerland and a few cheese dairies in the canton of Bern, production in small village cheese dairies, as well as the exclusive use of natural raw milk. 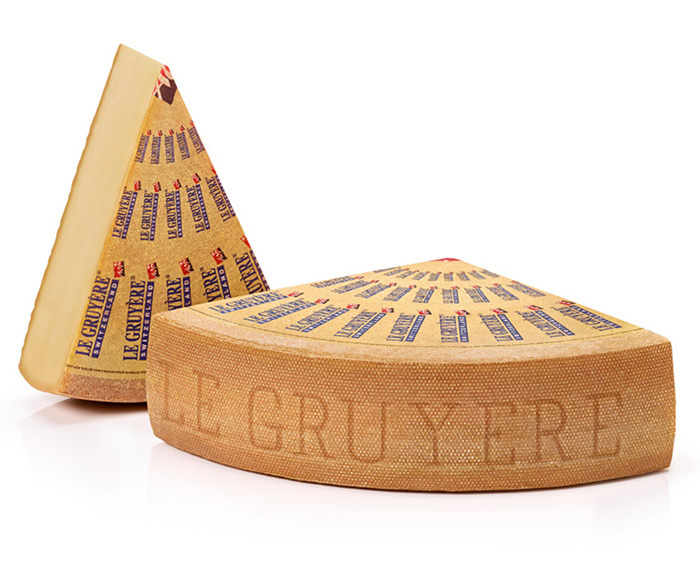 Only three passionate cheesemakers produce the Le Gruyère AOP for Gourmino AG. After the cheese have been ripened in dairy for a number of weeks, they are brought to the Gourmino ripening cellar. Only the best cheeses are suitable for the long affinage process. Local farmers deliver fresh milk to the dairy twice a day. They live in a distance of max. 3 kilometer to the dairy and have 8 to 20 cows. They know their cows mostly by name, pasture them on succulent flowering meadows in the summer and feed them sundried hay in the winter. This is the reason why our wheel labels carry flowers all over the wheels. The milk is rich in nutrients and is the basis for the quality and unique character of each cheese. Gentle, lush green slopes, pretty villages, farmhouses that hide beneath giant roofs, and wide, richly decorated courtyards signify the magical character of the area from which this great cheese originates. Each wheel is a piece of the finest handicraft as practiced in village cheese dairies for several centuries. Its tradition, appearance and outstanding quality make the Emmentaler AOP the world’s undisputed «King of Cheese». The milk used comes from happy cows, which are mainly fed with grass and hay from the farms themselves. Immediately after milking, the milk goes straight to the nearby village cheese dairy. There, the cheese master processes the fresh natural raw milk into the finest Emmentaler AOC every day. Only ten passionate master cheesemakers produce the Emmentaler AOP for Gourmino. They live with their families I small village or mountain dairies and care passionately about their handcraft. After the cheese have been ripened in dairy for a number of weeks, they are brought to the Gourmino ripening cellar. Only the best cheeses are suitable for the long affinage process. Flowering meadow Local farmers deliver fresh milk to the dairy twice a day. They live in a distance of max. 3 kilometer to the dairy and have 8 to 20 cows. They know their cows mostly by name, pasture them on succulent flowering meadows in the summer and feed them sun dried hay in the winter. This is the reason why our wheel labels carry flowers all over the wheels. The milk is rich in nutrients and is the basis for the quality and unique character of each cheese. This is a little, secluded hamlet in the community of Sumiswald, part of the beautiful and picturesqueregion of Emmental. The cheese is named after the small river “Hornbach” just passing a few meters fromthe dairy. This river can get very wild under certain circumstances, a good omen for this unique cheese! Thelocal farmers (living a distance of 3 km) deliver their fresh milk twice a daily. Their cows graze the wholesummer on the lush meadows and eat the fine hay during winter months. This guarantees a high milkquality, which is the main condition for a cheese that allows a natural ripening process. Sbrinz is a traditional cheese that has been produced for centuries in Switzerland. The name “Sbrinz” is thought to have originated in the town of Brienz in Switzerland. In the 13th century, the trade route from Lucerne, Switzerland to Domodossola, Italy was used to transport Sbrinz via pack mules; and it still exists today. The alp is 4,500 ft. above sea level, where a wide range of alpine herbs and flowers grow.